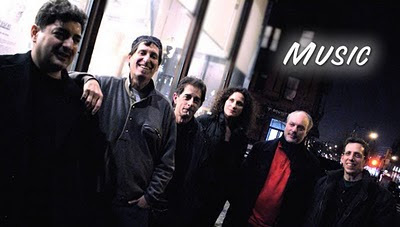 That's Yale Strom on violin, Elizabeth Schwartz singing, and Lou Fanucchi on accordion, with traditional Yiddish lyrics set to music by Yale Strom. When I moved here from Ohio 30 years ago, the first friend I made was Yael, the daughter of a rabbi from Israel. She had grown up immersed in Judaism's rituals, but left orthodoxy behind when she came to Los Angeles, married a businessman and settled in suburbia. Still, every fall, she would erect a sukkah (a makeshift shelter with wooden posts, canvas walls and leafy roof) next to the swimming pool in her backyard. For seven days, her family would eat every meal inside that shelter, in observance of the holiday Sukkot, considered in the Jewish faith "the season of our rejoicing." So I felt blessed this week by an unexpected invitation to join a family celebrating Sukkot. Rachel Malkin's offer was a "thank you," she said, for my Tuesday column about a group of women who repaired the crumbling home of an elderly, disabled woman and her seven adopted children. Their story was "delightfully inspiring," she said. Malkin's story would inspire me, as well. It's a holiday that passes unnoticed by non-Jews in most parts of this city, where there are no decorations or market specials. But in the Fairfax district (the heart of the Orthodox Jewish population in Los Angeles) the celebration is hard to miss. At night, brightly lit sukkahs shine from driveways and front lawns, and families led by men in black suits and broad-brimmed hats crowd the sidewalks outside homes and synagogues. I visited Malkin's home on Wednesday afternoon as she wrapped up her holiday preparations. She had jotted down a Sukkot primer on the back of an envelope for me. We talked on her patio shelter, fashioned from wooden blinds and a canopy of eucalyptus branches. "We build a sukkah and 'dwell' in it 7 days," she had written. "It is a mitzvah to say the bracha 'blessing'â¦" She read aloud to me from the Machzor, the Sukkot prayer manual, tracing the Hebrew words with her finger as I followed. She had downloaded a worship schedule from a local rabbi for me and saved an advertisement for a "High End Complete Kosher Sukkah, from $399, best price in town." She wanted me to understand the holiday, its context and conventions. I wanted to understand Malkin, a mercurial actress now consigned by her own beliefs to covered hair and modest dress. The rest of the article is concerned with Malkin's story, and you can read the article in its entirety by clicking here to head over to the LA Times website. And tell them that Congregation Adas Emuno sent you! Oh, and chag sameach! We look forward to meeting him on Friday at our Simchat Torah celebration! Here's some more Yale Strom, in anticipation of his Simchat Torah performance at Adas Emuno this coming Friday evening, this video courtesy of JLTV's YouTube channel. That's Yale Strom on violin, Elizabeth Schwartz singing and Lou Fanucchi on accordian performing "Ben Avrameni". As Reform Jews, we do not shut out the views and practices of other branches of Judaism, but rather seek to learn from them as we encourage everyone to find the spiritual connections and forms of Jewish practice that are most meaningful to them. Now that is one fast bit of Sukkah building! Happy Sukkot to you all! News flash! 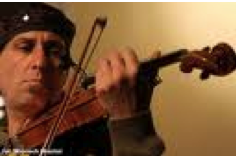 World renowned klezmer musician Yale Strom and his band, Hot Pstromi, will be the special musical guests for Simchat Torah Services at Congregation Adas Emuno, 254 Broad Avenue, Leonia, on Friday evening, October 1 beginning at 6:30 PM (please note the special starting time. The Simchat Torah Service will also include a Consecration Ceremony with Religious School Director Jennifer Katz-Goldstein welcoming our newest students for the 2010-2011 school year. For more information, contact the Temple office at 201-592-1712 or visit our website, www.adasemuno.org. What more can we say but, be there or be square, bubeleh! 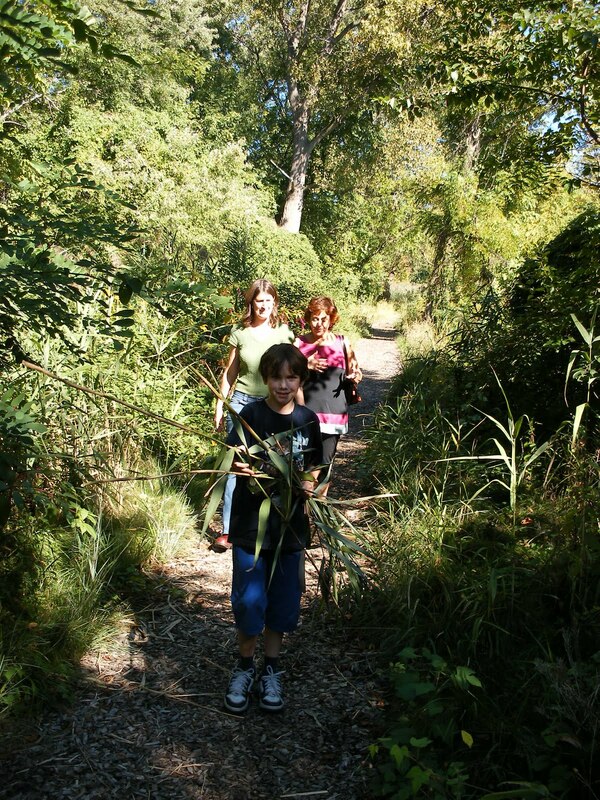 On Sunday, September 12, Congregation Adas Emuno was one of several Jewish synagogues and schools that came to the Teaneck Creek Conservancy in Teaneck, NJ to harvest reeds, which are used to build the ceremonial Succah for the Sukkot holiday. While cutting their holiday reeds, harvesters learned from Dr. Beth Ravit, a wetland scientist who also is a member of Congregation Adas Emuno, how their reed harvesting is helping to restore the urban wetlands of Teaneck Creek. The reed harvesters cut and removed Phragmites australis – the Common Reed. Phragmites was native to the New Jersey region and the species is known to have existed at least 1,000 years ago in the upland portion of northern New Jersey marshes and swamps. However, the genotype found here today probably came over from Europe or Asia in the 19th century, and some of its genes are different from those of the native species. The newcomer exhibits very aggressive growth patterns - growing to heights of more than 10 feet and shading out desirable native wetland vegetation. It also responds very positively to nutrients (especially nitrogen), and so when rain washes fertilizer off lawns and carries it down into the Meadowlands portion of the Hackensack River estuary we see Phragmites taking over the marshes that remain here today. However, Phragmites also is an amazingly helpful plant. Found worldwide, including on the shores of the Dead Sea in Israel, the plant removes excess nutrient pollution from water. It thrives year-round, sustained by an underground air and food supply system built of tough rhizomes that may be buried as much as two feet deep. In the Teaneck Creek Conservancy, where six stormwater pipes drain runoff from the streets of Teaneck, the Phragmites are helping to clean this water before it flows into Overpeck Creek on its way to the Hackensack River. 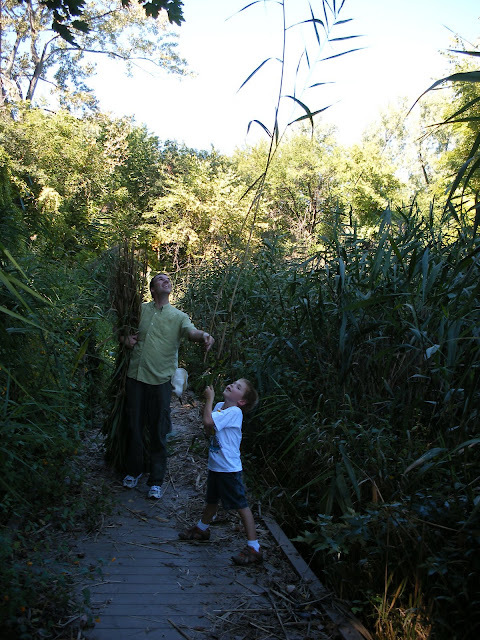 For this reason Teaneck Creek Conservancy wants to retain some Phragmites, but needs to keep it from spreading and taking over the entire park. The non-profit Teaneck Creek Conservancy is dedicated to the reclamation and revitalization of the lands and waters of a 46-acre property within Overpeck County Park for public use and enjoyment as a passive park and outdoor environmental and cultural education center. By cutting the Phragmites growing adjacent to the park’s walking trails, the harvesters help to contain the plant in its present location. This act of stewardship in our own County Park is a wonderful celebration of the Sukkot harvest and thanksgiving for the earth’s bounty. A lot goes into the technology to make this “amazing” gadget user-friendly for those using a GPS system or perhaps, printing out Mapquest directions before embarking on a previously untravelled route. Many creative people make this possible; each contributing value, each of these deserving our thanks. At the beginning of the summer, I met with our Cantor, and she asked me where I would like to see Adas Emuno “travel to” during my tenure as President. As a dentist in my professional life, I practice in a community where various patients attend the neighboring church and send their children to the parochial school. They speak of the school’s outside activities: the card parties, the various sports leagues, the senior luncheons and of course, Bingo! And it reminds me of my childhood synagogue, the Pelham Parkway Jewish Center. Yes, it was a place where I learned to read Hebrew, celebrate the holidays, and of course, spend time in shul. But it was also a place where my family participated in some of these same activities. I recall the annual PPJC-sponsored trips my parents went on, while my siblings and I enjoyed being “spoiled” by my grandparents who stayed with us while mom and dad were away. My grandma, despite her limited English, helped run the weekly Bingo night at the PPJC. While we may feel we are more “distinct” with the names of our congregations (Congregation Adas Emuno, Congregations Sons of Israel, Temple Beth Shalom, etc. ), and while our temple names given by our founding members may identify us, to some degree, think about it! Have we also become more isolated and self-limiting? The Pelham Parkway Jewish Center was a community center which not only brought Jews of a similar mindset together on the High Holidays, the festivals, and weekly Shabbat services, but brought people of all ages together on other days, nights and weekends for a variety of events and activities. As a result, the Jewish community flourished. As I begin my Presidency, I have been in contact with the URJ (Union for Reform Judaism) for ideas to make our Congregation a welcoming community, as well as a center for all of us to enjoy and to share: both inside and outside of our Sanctuary and Religious School. I have reached out to our Board of Trustees and other congregants who I fondly refer to as our “movers and shakers”, to get their input as to how we can implement my “vision” and achieve the ultimate goal: a thriving community center at Adas Emuno, sharing our common bond of Reform Judaism. So to answer our Cantor’s question, I hope to see our congregation involved in a “smorgasbord” of activities: an aerobics class, a strength-training class, at a barbecue, at a Bergen PAC performance, at the roller rink with our children, at family game nights, perhaps at a poker night; at a New Year’s Eve oneg shabbat with hors d’oevres and champagne for the grown-ups and and an alcohol-free New Year’s party for our teens (this year, December 31 falls out on a Friday evening)…actually in any venue our “Jewish Community Development Team” deems appropriate. I would especially like to see our congregation enjoy the monthly (or even more frequent) musical Shabbat service of yesteryear. I am asking a great deal from our team and our Board. Do not be surprised if our development group asks for your personal and financial help in getting these activities off the ground for all of us to enjoy this year and for years to come. We are all members of the Adas Emuno community--- we all need to contribute and help make our community thrive. For now, please program the following address into your life’s GPS: “254 Broad Avenue in Leonia”. Join me in this journey not only to keep Adas Emuno an inspiring place of spirituality, learning and worship, but also to create a community center which will put us on the map in “highlights.“ And if you have a Jewish Community Center idea, I am just an e-mail away at specto5 at earthlink.net. Cantor Shapiro and all of us on the Board of Trustees look forward to seeing you at weekly services throughout the year, and I especially look forward to welcoming you at the High Holidays, to personally wish you a Happy and Healthy New Year. I wrote this poem last year, inspired by the beauty of the musical performance that accompanies the Kol Nidre ceremony. This version of features Stjepan Hauser with The Metropolitan Sinfonia, conductor Tommy Harrington, live from St George's Bristol at the Gala Tribute Concert dedicated to Mstislav Rostropovich, December 2007. At Congregation Adas Emuno, we enjoy a somewhat more modest performance of the Kol Nidrei by Max Bruch, with Fran Rowell on cello and Beth Robin on piano, but it is nonetheless stirring and inspirational to listen to these two very talented musicians play this prayerful piece on Yom Kippur. Indeed, it is something for us to look forward to during the rest of the year. "Echoes of a Shofar" is the premiere episode in the "Eyewitness 1948" short film series produced by Toldot Yisrael and the History Channel. It is the centerpiece of an educational pilot program being developed with The iCenter and made possible through the generous support of the Jim Joseph Foundation. Modeled on Steven Spielberg's Survivors of the Shoah Visual History Foundation, Toldot Yisrael is a Jerusalem based nonprofit organization dedicated to recording and sharing the firsthand testimonies of the men and women who helped found and build the State of Israel. Over 300 video interviews have so far been conducted with those who were involved during the pre-State struggle and the momentous events of 1948. Our aim is to conduct hundreds more over the next several years while it is still possible. For more information on Toldot Yisrael, take a look at their website at http://www.toldotyisrael.org. We are gathered together here at Congregation Adas Emuno to observe Yom Kippur, the Day of Atonement. But, you knew that already. Jews all over the world have been gathering together for Yom Kippur. And even those of us who do not observe the holiday know that this is the Day of Atonement, and this is a day when we all feel especially Jewish. Of course, this is also a day when we feel especially hungry, but feeling hungry is simple enough to understand—feeling Jewish, now that's a bit more complicated. We could spend the entire day discussing what feeling Jewish is all about, but one thing that's especially Jewish is asking questions. In our tradition, we're allowed to ask questions, and we’re encouraged to ask questions, so much so that the first religious role that we give to our children is to ask the four questions at Passover. Why is this night different from all other nights? For millennia, our scholars and spiritual leaders have been asking the fundamental question, how does God want us to live our lives? And in looking to the Torah for answers, they have found themselves asking still more questions, such as, How are we to understand these writings that speak to us from a distant time and place, and how can we apply their messages to contemporary life? And in our tradition, we can even question God. Job asked God why bad things happen to good people. Jonah questioned why the city of Nineveh was spared from divine retribution. Moses wondered why he, of all people, had to be the one to confront the Pharaoh and lead his people to freedom. And in Fiddler on the Roof, Tevye says to God, " I know, I know. We are Your chosen people. But, once in a while, can't You choose someone else?" On Yom Kippur, we are especially chosen, especially Jewish, and especially questioning, as we question ourselves, our actions and our intentions, our mistakes and our wrongdoings. But to be especially Jewish, I believe, we also need to ask, why is this night different from all other nights? Why do we have a Day of Atonement? After all, in our tradition, we can pray at any time, we can repent on any day of the year, God is always listening, and willing to forgive. We don't have to wait for Yom Kippur to atone. So why do we have Yom Kippur? I believe that is a question worth asking, and I want to share with you what I think the answer might be. I offer this to you as my own thoughts about Jewish spirituality in the modern world, with no intention of imposing them on you, but in the hope that it might help you to ask questions of your own, and arrive at answers that are meaningful to you. We refer to this time of year as the Days of Awe, with Yom Kippur marking the end of a ten-day period that begins with Rosh Hashanah. And to understand the ending, it helps to begin at the beginning, and Rosh Hashanah is a celebration of beginnings, of In the beginning, Bereishit, Genesis, the Creation of the World. We say that Rosh Hashanah is the Birthday of the World, and by “the World” we don’t just mean the planet Earth. The Torah tells us, “In the beginning God created the heavens and the earth.” The World, then, refers to all of God's Creation, or in more contemporary terms, the universe. And whatever our beliefs may be, how can we not stand in awe before a universe that our scientists say is approximately 14 billion years old, and that is at least 92 billion light years in diameter, a single light year being almost 6 trillion miles. And how can we not stand in awe when we consider that we, our planet, our solar system, and our galaxy, are moving at a speed of 1.3 million miles per hour as the universe continues to expand due to the force of the Big Bang that occurred some 14 billion years ago. O Eternal One, our God, how glorious is Your Name in all the earth! whose majesty is set above the heavens. Out of the mouths of babes and newborns, You deliver strength in the face of adversity, and still the voices of violence and vengeance. What is humanity, that You are mindful of us? Mortal beings, that You think of us? Yet You have made us but little lower than the angels, and have crowned us with glory and honor. The birds of the air, and the fish of the sea; all that passes through the paths of the seas. O Eternal One, our God, how glorious is Your name in all the earth! Thinking about how small we are in comparison to the immensity of the universe may be enough to put the fear of God into anybody, but fear itself is not what Yom Kippur is all about. The Days of Awe cannot be reduced to shock, or intimidation, for they encompass that sense of wonder at the majesty of the World, and the miracle of our own existence. But the High Holy Days are more than just a reminder of Creation as an event that occurred a long time ago, that came and went at some time in the past, and has long since been over and done with. Creation is an ongoing process that is dynamic, unfolding from one moment to the next. We are riding on the Big Bang, and everything that exists in our expanding universe came from that initial point of Creation, so that we are all made of the same stuff that stars are made of. Or to invoke the Jewish mystical tradition of the Kabbalah, we are reflections of God's divine light, all of Creation emanates from God's first action. In the beginning, there was sound, a form of energy, as God speaks. That’s the Big Bang of the Bible, and we are riding that first utterance to this day. “And God said, let there be light, and there was light.” And the speed of light is the only constant in the universe, as revealed by Albert Einstein in his famous equation, E=MC2, which expresses the idea that everything in the universe is a form of energy. Even things that appear solid and stable to us, including ourselves, are actually a dynamic dance of subatomic particles. We are all made of energy, we are all made of the same stuff as stars, we are all echoes of God’s words and reflections of God’s light. Central to our faith is the belief in One God, in the unity of the Divine, the wholeness of all that is Holy. And as there is One God, there is One Creation, and so there is an underlying unity that binds everything together in interdependent relationships. Einstein explained that there is no space outside of time, and no time outside of space; there is only the single unity that he called spacetime. And we can understand, then, that Creation is the entirety of spacetime, all of the space that ever was and ever will be, and all of time, past, present, and future. Creation, being made in God’s image, reflects the Oneness of God, and there is also an underlying unity that exists between Creation and Creator. We call Yom Kippur the Day of Atonement, and the word “atone” originates as a contraction of two words, at and one. Yom Kippur is the Day of At-One-Ment, a day when we join as one with all of Creation, and together seek communion with our Creator. The word universe, with the prefix uni-, speaks of oneness, togetherness, wholeness. But the universe is also diverse, the unity of Creation also includes the quality of difference, the differences between light and darkness, day and night, the heavens and the earth, the land and the sea, plants and animals, male and female, the sacred and the profane. These differences make it possible for all things to change, and grow, and evolve. All forms of life evolve, but so too does the universe itself evolve, as it expands and forms galaxies, and stars, and planets. And it is also the human mind and consciousness that evolves, as we develop new ways of knowing and understanding our world. It's been said that the Jewish people invented history, as the Torah and the rest of the Bible tells the story of our evolving relationship with God, a story that continues to this day, a story that we all are a part of right here and now, as we have entered the year 5,771. We count the years, as we think of history and evolution as a progression along a straight line, a journey down a road from beginning to middle to end. But we count the years in two different ways, as we live by two different calendars, the solar calendar that comes to us from the Roman Empire, and our own modified lunar calendar, which we use for religious purposes. And I am certain that every one of you here tonight has either said or heard someone remark that Rosh Hashanah and Yom Kippur are very early this year. And in response to that, I want to say to you, it is September that has come very late this year. That is, Rosh Hashanah and Yom Kippur never come early, or late, they come exactly when they are supposed to come, on the first and tenth days of the month of Tishrei. In truth, from a scientific point of view, neither calendar is more real or more true than the other, and all that we can really say is that the High Holy Days are early in relation to the Roman calendar, and that September is late in relation to the Jewish calendar. And I can't help but wonder if this understanding didn't have some influence on Einstein as he developed his Theory of Relativity, which states that the passage of time is relative to the speed at which we're traveling. We live within different calendars, but within the calendar, we live within two different types of time. There is the idea of time as a line or road, as moving forward and evolving. But we also have the sense of time as a cycle, as a circling around, and revolving. And it is through our religious traditions that we sanctify the circle of life, the cycles of maturity and marriage, of birth and of death. And we celebrate the cycles of the year, the seasonal festivals of Sukkot, Passover, and Shavuot, and the cycle of Torah readings that end and begin again every Simchat Torah. And we gather together, as we do now, to celebrate the Days of Awe as a time of renewal. These cycles represent a sacred time, separate and distinct from the profane time that we envision as a straight line. These cycles give us the opportunity to connect to the time of Creation itself, which is an ever-renewing process. Creation intersects with all times, but it exists outside of profane, linear time. Creation is not the year One, or the year Zero; if anything, it is the year Infinity. And if all this makes your head hurt, then I ask you simply to think about those moments in your lives when times seems to slow, or even stand still, when everything seems to stop; moments when it seems like you're stepping outside of yourself, when you feel like you're at one with the universe, when you experience Eternity. That experience of timelessness goes hand-in-hand with those feelings of awe and wonder expressed in the 8th Psalm of David, and they often come in response to an encounter with the glories of nature. We can have these experiences anywhere, and they can come upon us unexpectedly. But our sanctuary and our ceremony are here to help us obtain that sense of oneness, to help us to feel that connection to sacred time. Some of us here tonight may be feeling that sense of connection to Creation and Eternity, some of us may not, but by gathering together we are all lifted up as a congregation, and together we have entered that sacred time. We don't have to do it alone, and more importantly, we can't do it alone. You can pray to God by yourself, but you can't practice Judaism by yourself, and in that sense you can't be very Jewish by yourself. It takes a village, it takes a minyan, it takes a community to achieve communion. Einstein, with his theory of relativity, said that everything in this universe exists only in relation to everything else. Another of our great sages of the 20th century, Martin Buber, said that everyone in this World exists only in our relationships, our relationships to other people, to other things, and to our God. Therefore, it is not sufficient to atone all alone, we have to atone together. In the Book of Genesis, not long after the story of Creation, and the story of Adam and Eve, we find the story of the first murder, as Cain kills his brother Abel. And God asks Cain, "Where is Abel, your brother?" God would have known the answer, of course, but the importance is in asking the question, to which Cain responds, "I know not, am I my brother's keeper?" Through this negative example, the Torah drives home the point that we ought to be our brother's keeper, that we are responsible for each other. And God then says, "What have you done? The voice of your brother's blood cries to me from the ground." This poetic statement is echoed later, in the Book of Leviticus, in the commandment that says, "You shall not stand idly by your brother's blood." In this way, we are commanded to take responsibility, not only for ourselves, but for others. Just as we gather together to be at one as a community, we gather together to atone as a community. That is why we have Yom Kippur, why we have a Day of Atonement. In our faith, we are our brother's keepers, we do not stand idly by, we feel a sense of shame when one of our own is guilty of wrongdoing, and we take responsibility for our family, our friends and neighbors, our congregation and community, our nation and our people, and for humanity and Creation. We are gathered together to atone, not only for ourselves, but for each other, for the mistakes and the sins that we have committed collectively as well as individually, because we are all connected to one another, all responsible for one another. And we are here to repent and commit ourselves to doing better both individually and collectively, because we cannot fight the evils of the world on our own. Only together can we address such problems as poverty and hunger, prejudice and hatred, ignorance and fear, violence and war. In our tradition, we are not satisfied with the way things are, we are obligated to strive to make things better, to work for progress, growth, and evolution. In our tradition, we don't believe that this is the best of all possible worlds, we believe that Creation is an unfinished business, and that this is a broken world, God knows that we have experienced just how broken it can be, and that it needs to be repaired. In our tradition, we do not accept the status quo as a matter of fate or predestination, we ask questions, we ask, why?, knowing that Creation is a Book that is still being written. In our tradition, we don't say, "let it be," we say, "let me help." Everyone is searching for meaning and purpose in a world where we are so overloaded with information, and entertainment, and material things, but in our tradition, the meaning and purpose of our lives was clearly expressed by the prophet Isaiah: "I, God, have called you to righteousness, and have taken you by the hand and kept you. And I have made you into a covenant of the people, and a light unto the nations." We are here to carry on God's work, the Creation that began with light, and we are here to continue what God began in the beginning, to heal and repair our broken world. It is a daunting task, sure, but in the words of Rabbi Tarfon, "You do not have to complete the work, but neither are you excused from it." To which we can add, it is not your responsibility alone to do the work, but it is our responsibility to work together. I am reminded of the Chanukah song that Peter Yarrow wrote, that was performed by Peter, Paul, and Mary, called "Light One Candle." The chorus goes, "Don't let the light go out. It's lasted for so many years. Don't let the light go out. Let it shine through our love and our tears." And so, maybe on this Yom Kippur, during this sacred time, a good question to ask ourselves is, will we let the light go out? Or will we keep it going? How can we work together to strengthen the light of our congregation, so that it can continue to provide warmth and illumination for all of us, and for the generations to come? How can we keep the light of our faith and our people shining so as to fulfill God's covenant and Isaiah's prophecy? How can we help to generate the healing light of tikkun olam, and contribute to the light of Creation, the light first kindled by the Creator? How can we make the light that shines within each and every one of us to shine ever more brightly? And how can we bring that light within us together in unity, because when we are gathered together as we are tonight, our light can shine as brightly as the stars. We are gathered together here at Congregation Adas Emuno because Yom Kippur, the Day of Atonement, is the time for us to begin anew. That this year's gonna be a good year! May it be God's will that it be so! During this very hot summer, I talked lots of poetry with my friend Joan Klein. We shared favorites and suggested new poems and that talk enriched me and my dedication to words. Emily Dickinson has defined poetry in this way: She said,“If I read a book and it makes my whole body so cold no fire can ever warm me, I know that is poetry. If I feel physically as if the top of my head were taken off, I know that is poetry. These are the only ways I know it. Is there any other way?” So hang onto your kippas or yarmulkas , and let me add that I know it’s poetry when the words echo in the crevices of my heart. Celebrate the Birthday of the World!